How Do You Get Carpets Really Clean, with No Residue Left Behind? A lot of people think it is simple enough just to vacuum. Zerorez® points out their technological advances that may change the way that customer clean their homes. Most traditional carpet cleaning companies employ the traditional hot water extraction method that requires soaps, shampoos or harmful chemicals, some of which are left behind in the carpets as a soil-attracting residue. This residue makes carpets actually appear dirtier faster, leading to unsatisfied customers. Since 2002, Zerorez’s mission has been to revolutionize the carpet cleaning industry which has been cleaning the same old way for 70 years. Unlike traditional carpet cleaning companies that use soaps or detergents or toxic chemicals in their cleaning process, Zerorez has a patent-pending cleaning system that features Powered Water®, which acts like a detergent at the molecular level, yet does not leave any soil-attracting residue behind. This process leaves carpets looking cleaner for a longer time, and lessens the time it takes for carpets to dry. With this revolutionary cleaning method, we are introducing our customers to The Right Way to Clean®. What’s the “secret?” It is applying technology to cleaning in a fresh new way. A way that results in a truly green, cleaner clean. This is a clean that is green for the environment and GREAT for the home. Let’s face it. Residential and Commercial cleaning is a huge industry. There are thousands of undifferentiated operators, many of whom have no support, little consistency and high personnel turnover. Sure, they can do a “basic job,” but what you want is a great clean, a fresh clean, a dependable clean that lasts longer. And, that is just what Zerorez provides! Zerorez has earned a Platinum rating from the Carpet & Rug Institute (CRI)-the highest rating possible—which demonstrates the efficiency of its cleaning process. This rating system was designed with customers in mind to help them find cleaning companies that are efficient and responsible to get the job done right the first time. 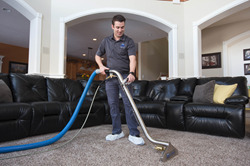 Great cleaning starts with a simple call or on-line connection with one of our independent franchise operations. We take great pride in a positive “golden rule” contact with each customer, and work with that customer all the way through the scheduling to the service to the follow-up after each cleaning job. Our aim is to create “Raving Fans,” and we work hard to achieve that. A key measure is our industry-leading percentage of highly positive reviews, which we cherish. We don’t aim to be the biggest in our industry, but we do aim to be the best and “most trusted” service provider in the industry.